Grateful for Bro. Charles and his vision for multiplication and encouragement for church planting everywhere. May his tribe increase. Was back at Hope Church of Waldheim tonight for a men’s gathering. Heather & I moved to Covington in 2001, to be a part of starting a church in the community of Waldheim. So many great memories in this community. And so many hard lessons. Church planting in Waldheim brought me to the end of myself many times, as church planting will usually do. Wrote about the journey in the post Overheard as a North American Church Planter. Timeline: Started in October 2001 as a Home Bible Study. Began weekly worship gatherings in October 2002. Worshipped in an unairconditioned Fire Station for 2 years. Moved into a former cafe/truck stop in 2005. Survived Hurricane Katrina in 2005. 55 baptisms in first five years. 1,000’s came on volunteer missions trips from Texas, Louisiana, Alabama, Kentucky, Mississippi, & South Carolina to serve this community through Hope Church between 2002 & 2008. Grateful to have been a small part of the story of this church that will hopefully be a light to the unchurched in the Waldheim community & beyond for generations to come. Spent some time today roundtable-ing with ministry leaders in the Northshore Baptist Association around the topic of technology. Thanks to Louisiana Media Group for leading & providing rich content on a variety of topics, AND for providing lunch for our gathering. We also heard from Magnolia Development Group on Web & Social Media questions. These are two trustworthy companies working together to provide affordable, accessible solutions for church tech issues. Joe McCarty, Tech Associate with The Village Church in Dallas, and Brandon Cox, editor of Pastors.com & author of Rewired, spent some time with us as well. They both reiterated the importance of getting on top of mobile development. Technology is affecting ministry in many ways. Great discussions today about how to utilize technology without going broke or crazy. How has technology helped or hurt your ability to reach people for Christ? What’s the big tech issue you’re facing right now? Over the last two weeks the Northshore was blessed to play host to World Changers in Tangipahoa & St. Tammany Parish. 35 home repair projects were completed and dozens of local churches as well as youth groups from around the country, who paid their own way, partnered to make real change happen for elderly, disabled, disadvantaged families in our region. Thanks to FBC Ponchatoula and FBC Covington for hosting. Couldn’t have happened without them. They mobilized dozens of volunteers to prepare meals and make 100’s of volunteers comfortable on their campuses. Also, dozens of local churches prepared and delivered lunches for crews serving in the community. Dennis Ellzey, Youth Pastor at FBC Ponch and Abe Haley, Student Ministry Associate at FBC Covington did great jobs as Project Coordinators. Also, couldn’t have done it without Agency Reps who raised money for materials and provided coordination: the Fuller Center for Housing in Hammond led by Tamara Danel and St. Tammany Parish Governments Social Services Dept led by John Tobin. Construction coordinators were Tom Rabalais in Hammond and Adam Martin with Kent Construction’s Faith Division in Covington. 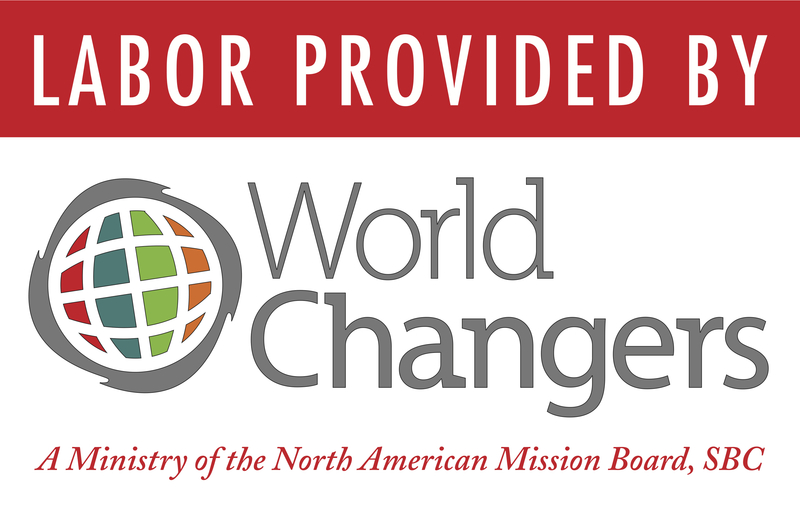 World Changers is a great partner for community revitalization and for cultivating a region for gospel penetration and church multiplication. It’s also a great way to bring Associational churches together for good in the community. I think every association should see if World Changers would be a fit for its region. Our National Staff rep in Louisiana is Bill Kisner – bill.kisner@lifeway.com. Get in touch and find out more about World Changers. Next year we’re hoping to pull off four World Changers sessions on the Northshore: Spring Break at Camp Living Waters and Summer sessions in Hammond/Ponchatoula, Covington, & Slidell. I’ve been saying it would be neat if World Changers could do 75-100 home repair projects on the Northshore and then our local churches could match it with 75-100. 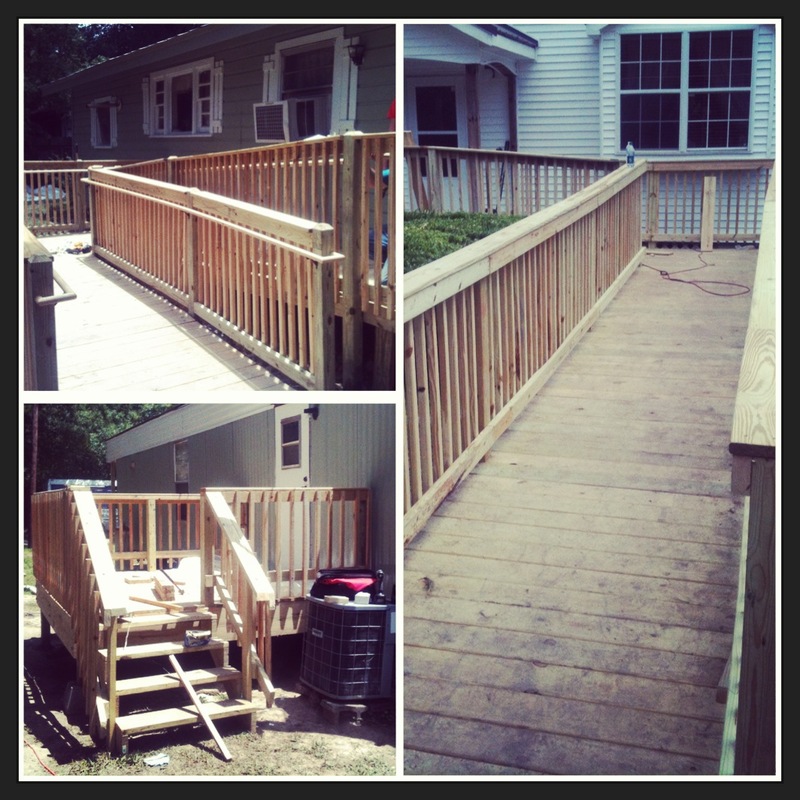 150-200 home repair projects on the Northshore in 2014! Let’s do it! I like this line of thinking. Just like the human body stays healthy because of healthy systems – respiratory, nervous, digestive, skeletal, etc., a church needs healthy systems to stay healthy. 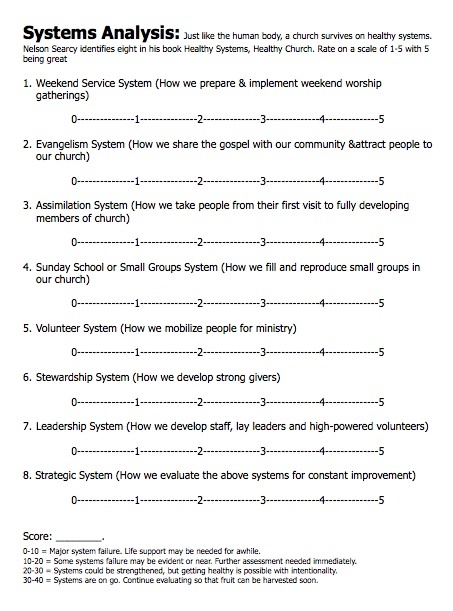 Here’s an Assessment tool we’ve developed to help a church leadership team assess its systems. Get Nelson Searcy’s book on systems here. This image gets even those most entrenched in the attitude “we’re fine the way we are” thinking about the need to change. Great tool to help churches diagnose their need for revitalization. The next question is – How? How do we refocus? re-energize? Restructure? Restart? Stats taken from each zip code where there is a Northshore Baptist church showed only a slight uptick of .4% in population growth (from 343,794 to 345,225). Baptisms continued to slide in Northshore churches, down 11% to 812. Down 25% from 1990’s all time high of 1,077. Ten Northshore Baptist churches reported zero baptisms. Seventeen more reported five or less. Sunday School/Bible Study attendance increased 2%. 6,786 attended a Bible Study on any given weekend which is equal to 2% of the population. Worship attendance increased 1% to 11,312 individuals attending a worship service in a Northshore Baptist Church on any given weekend. That still equals to only 3.3% of the population. How do we move forward? In 2011, we outlined four keys and they are still true and still our focus. A breakout church is defined by Thom Rainer in his book by that title as a church that reaches at least one person for Christ every two weeks or 26 persons per year, has a conversion ratio of 20:1 or 1 conversion for every 20 members per year, has tenured and consistent leadership, and the church makes a clear and positive impact on its community. The momentum of growing churches breaking out will help us catch up with population growth and move past a season of decline. Riskier church planting would be multiplication that targets hard to reach areas and unchurched pockets of our population. Missiologist Alan Hirsch suggests that current church models are reaching out to smaller and smaller segment of the population, with possibly as much as 60% of America untargeted by our evangelistic and outreach efforts. Our probe identified multi-housing residents as one potential segment that is underserved. Others may be those in their early 20’s with very little understanding of religion in any form. We need some church plants that go beyond planting a worship service that looks similar to others in the community, but will ask the question “Where is the church not?” and go there with the gospel. We need some church plants that have different scorecards and different expectations, but will faithfully deliver the message of Christ to unchurched people. 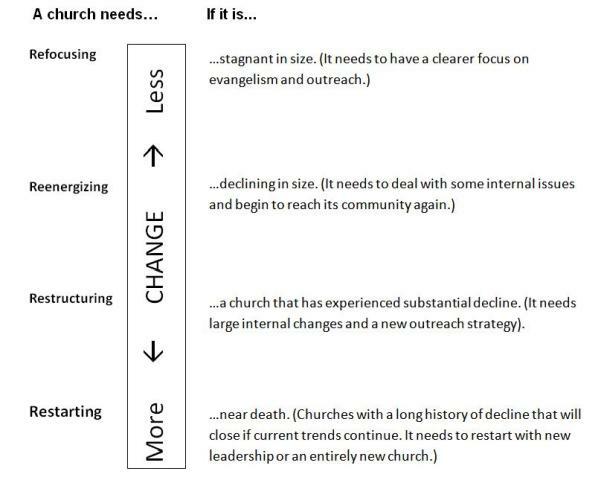 Church revitalization is needed to turn momentum around for congregations that are not effectively reaching their communities. Churches are needed who are willing to adopt or sponsor or merge with existing congregations for the glory of God. And churches are needed who are willing to admit there in need of coming under the wing of a benevolent parent church or work with a church wanting to help then in a revitalization effort. Call it revival, lay renewal, or awakening, what we need is a revolution of discipleship that will lead Northshore Christians to multiply themselves spreading the Gospel like a sneeze to their neighbors, classmates, coworkers, and beyond. In his book Church 3.0, Neil Cole observes, “we have lowered the bar of what it means to be a Christian, such that simply showing up to the weekly one-hour event with some regularity and a checkbook is all it takes.” We must refocus on making disciples who will reproduce themselves by telling others, inviting others, and discipling others.